If you want your child to learn how to swim, it’s important to realize the environment in which he or she practices is nearly as important as the instruction itself. A supportive environment, one that’s designed to streamline the learning process, can have a profound effect on a student’s ability to progress. The wrong environment can hamper the process and make learning less fun, less engaging, and more frustrating. In short, the venue matters. We’ll clarify the reasons below by highlighting the six biggest downsides to practicing in a public pool. Learning to swim requires concentration. It calls for focus. A facility open to the public will invariably attract children whose behavior will be distracting to the student. Splashing and jumping in the pool not only creates a visual distraction, but also causes waves that make practice more difficult. The distraction can prove especially detrimental to beginners. Such students must devote their attention to mastering the basics, like holding their breath, forward movement, etc. Any diversion is likely to break their concentration. In addition to creating a distraction, other kids’ roughhousing can present safety concerns. For example, an individual may jump in the water near your child. If the individual is careless, he or she might make contact with your child, injuring him or her and/or making it difficult to breathe. While most public pools have attendants on duty to watch for trouble, it’s not uncommon for horseplay to get out of hand. In order to learn how to perform freestyle, backstroke, butterfly, and breaststroke, the student must have sufficient room. That’s the only way he or she can hope to perfect each stroke’s execution. Practicing in a public pool can be problematic in this regard. When the pool is crowded, there may not be enough room to perform the strokes. The pool is unlikely to be sectioned off into lanes. Other visitors in close proximity are likely to interfere, even if unintentionally, with your child’s practice. There’s no way to tell for certain how crowded a public venue will be on any given day. You can make a general forecast based on the weather (summer draws more people than winter) and recent foot traffic patterns. But it’s still little more than a guessing game. If you’re unable to anticipate the level of traffic in a public pool, the outcome of every visit becomes uncertain. 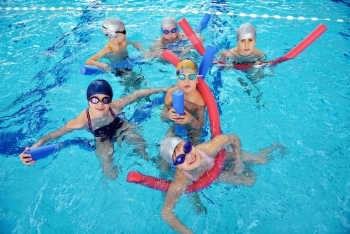 Professional instructors have experience in teaching people of all ages how to swim. They know how to keep the sessions fun, how to motivate students to learn new skills, and when to offer one-on-one guidance. Students who have access to swim instructors tend to progress more quickly than students who don’t. When your child practices swimming in a public pool, he or she can’t benefit from the direction and insight of a professional trainer. Progress is thus likely to occur at a slower pace. It’s also likely to be more frustrating. Thousands of people of all ages, from toddlers to seniors, have learned to swim at the DuPage Swimming Center. Explore our various swim programs to find the ones that best complement you and your family. Learn how to swim in a comfortable facility designed to cater to students who wish to become proficient in the waters.